Endemic to the Upper Amazon in Peru. The vast majority of specimens seen for sale in the UK originate from commercial farms in Eastern Europe. Slow moving tributaries of the main river channels, usually under forest cover. A standard 24″ x 15″ x 12″ (60cm x 37.5cm x 30cm) – 70 litre tank is suitable for a small shoal of these. 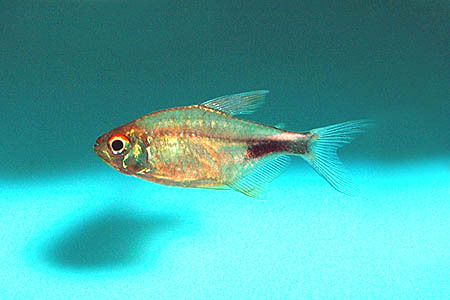 As it is captive bred, it’s adaptable and will do well in most tanks. It does look particularly effective in a heavily-planted arrangement, though, and can appear a little washed out in very spartan setups. If you really want to see it at its best, you could set up a biotope tank. Use a substrate of river sand and add a few driftwood branches (if you can’t find driftwood of the desired shape, common beech is safe to use if thoroughly dried and stripped of bark) and twisted roots. A few handfuls of dried leaves (again beech can be used, or oak leaves are also suitable) would complete the natural feel. Allow the wood and leaves to stain the water the colour of weak tea, removing old leaves and replacing them every few weeks so they don’t rot and foul the water. A small net bag filled with aquarium-safe peat can be added to the filter to aid in the simulation of black water conditions. Use fairly dim lighting. Under these conditions, the true beauty of the fish will be revealed. Easy to feed. It will readily accept just about anything offered. For the best condition and colours offer regular meals of small live and frozen foods such as bloodworm, Daphnia and brine shrimp, along with dried flakes and granules. Will do fine in most ‘general’ community tanks. It is lively, quite colourful and peaceful. It’s a good tankmate for most livebearers, danios, rasboras, other tetras and peaceful bottom dwellers such as Corydoras or smaller Loricariids. 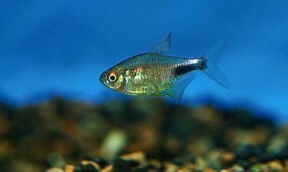 It can also be kept with the majority of commonly available gouramis and dwarf cichlids. It is quite shy, so don’t keep it with anything much larger or more boisterous. In a biotope tank as described above, it can be combined with other Hemigrammus or Hyphessobrycon species, pencil fish, Apistogramma dwarf cichlids and the aforementioned bottom dwellers. Always buy a group of at least 6 of these, preferably 10 or more. It is a shoaling species by nature, and will fare much better when in the company of its own kind. It actually looks far more effective when maintained like this anyway. Apparently, it can be sexed by examining the swim bladder, which is fairly visible through the translucent skin of the fish. This tapers to a point in males, but is rounded in females. Adult females also tend to be slightly larger and more heavy-bodied than males. Quite easily accomplished. You’ll need to set up a separate tank if you want to raise decent numbers of fry. Something around 18″ x 10″ x 10″ in size is fine. This should be very dimly lit and contain clumps of fine-leaved plants such as java moss or spawning mops, to give the fish somewhere to deposit their eggs. Alternatively, you could cover the base of the tank with some kind of mesh. This should be of a large enough grade so that the eggs can fall through it, but small enough so that the adults cannot reach them. The water should be soft and acidic in the range pH 5.5-6.5, gH 1-5, with a temperature of around 80-84°F. Filtering the water through peat is useful, as is the use of RO water. A small air-powered sponge filter bubbling away very gently is all that is needed in terms of filtration. Alternatively, it can be spawned in pairs. Under this technique, the fish are conditioned in male and female groups in separate tanks. When the females are noticeably full of eggs and the males are displaying their best colours, select the fattest female and best-coloured male and transfer them to the spawning tank in the evening. They should spawn the following morning. In either situation, the adults will eat the eggs given the chance and should be removed as soon as eggs are noticed. These will hatch in 24-36 hours, with the fry becoming free swimming a 3-4 days later. They should be fed on an infusoria–type food for the first few days, until they are large enough to accept microworm or brine shrimp nauplii. 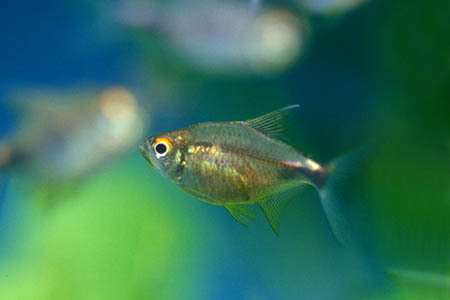 The eggs and fry are light sensitive in the early stages of life and the tank should be kept in darkness if possible. 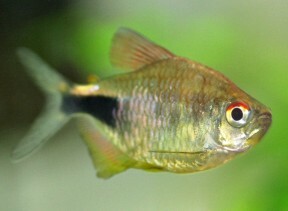 Also known as the garnet or black wedge tetra, H. pulcher is deservedly popular in the hobby. It’s both hardy and inexpensive, and is a good choice for the beginner. There was previously a subspecies, H. pulcher haraldi. This has now been reclassified as a distinct species, H. haraldi.